Sort through everything and identify items that are truly needed. Everything else can be sold at a garage sale, donated to charity, offered on Freecycle, etc. The less stuff one moves, the less weight ... and that means less fuel. Gather moving materials and containers. Rather than buy new packing boxes and bubble wrap, check with the local grocery store or liquor store for usable boxes. Many people offer used packing materials on Craigslist and Freecycle. Keep an eye out for people moving into your area and ask them for any boxes which they no longer need. Consider things you already have ... towels, sheets, pillows, etc. can be used instead of plastic bubble wrap or Styrofoam "peanuts". Check with moving companies who may offer reusable containers and wrapping materials. Take a little time to plan your travel route and choose the most fuel efficient of your choices. Rent the smallest truck possible and ask the company if they offer fuel-efficient vehicles. If personal vehicles are being used, make sure that tires are inflated properly and plan for as few trips as possible. Clean windows, mirrors and floors with vinegar. Use a 50/50 solution of baking soda and vinegar to scrub down bathrooms and kitchens (including the refrigerator and oven). Sweep patios/decks rather than using a leaf blower. If the new home needs cleaning, use environmentally-friendly products. Check to see if anything needs fixing (water leaks, window caulking, etc.). Once unpacked, recycle any moving boxes and materials ... again, think about offering them on Freecycle or Craigslist. Perhaps the moving company will take them back for reuse. As a last resort, break them down and take them to the nearest recycling center. File a temporary change of address with the Post Office instead of a permanent address change. Here's an interesting fact ... the Post Office sells lists of permanent address changes to advertisers (they don't bother with the temporary ones). So, to prevent an influx of junk mail, file a temporary, rather than permanent, address change. Moving can be the adventure of a lifetime, a beginning and an opportunity. With a little thought, it can also be earth-friendly. As always ... I would love to hear from you! Happy Spring! We are now officially past winter (I can hear the applause). Increasingly the days will be become warmer and we'll see more sunshine. It's the time of year when my thoughts turn to planting a vegetable garden and anticipating whole foods at my finger tips. Eating whole foods, preferably organic, results in a lower risk of many types of cancers and chronic diseases, and promotes healthy aging and higher energy levels. Consuming fruits, vegetables and whole grains rich in antioxidants translates into a lower incidence of cataracts. Whole foods contain high levels of minerals and vitamins. They are loaded with antioxidants which protect the body from free radicals (these are the culprits which promote diseases). Plant based whole foods contain Phytoestrogens, a special class of phytonutrients that include isoflavones and lignans. Phytoestrogens have been found to protect against certain cancers, most notably breast cancer. They are loaded with dietary fiber and resistant starches making them essential to intestinal health and help prevent colon cancer. Whole foods contain no artificial ingredients or preservatives. The healing properties of whole foods are non-toxic and inexpensive. For example: apples help reduce cholesterol, bananas strengthen the stomach lining against acid and ulcers, and bell peppers help to fight off colds. It's economical ... for the price of a package of seeds (approximately $2.00), you'll get fresh produce throughout the summer. If you share seeds or use ones from previously grown crops ... the price is even less. Imagine ... for the price of one head of lettuce in the market, you can get an entire season of lettuce. It's healthy ... growing your own veggies means you control what goes on them. You get to decide if chemicals touch your food and, hopefully, you'll opt for organic gardening methods such as the use of lady bugs to control aphids and other pests. It's good for the earth ... rather than traveling across country to reach your grocer's shelves and adding to air pollution, your veggies reside just outside your kitchen door. And no processing such as chlorine washes for your veggies ... just pick them, rinse them and eat. It's educational ... children love to garden and watch things grow. Having a garden is a wonderful family activity and one which teaches children about sustainability. It's fun ... we loved digging in the dirt as children and I'm betting that most of us (perhaps secretly) love it as adults. And ... if we compost, we recognize an additional advantage: composting reduces waste. It's a wonderful way to nourish a home garden and it saves landfills and waterways. This spring, consider growing your own whole foods .. it'll be good for you and the earth! Do those Twinkies hurt the earth? Hydrogenated and Partially Hydrogenated Oils create trans fats which increase LDL (bad) cholesterol in the blood and decrease HDL (good) cholesterol. They have been linked to heart disease, strokes, and contribute to diabetes. A 2% increase in calories from trans fats can result in a 23% increase in the risk for heart disease. High Fructose Corn Syrup (HFCS) has been linked to insulin and leptin resistance. Insulin resistance is when your body doesn’t use the sugars that you eat correctly. Leptin resistance is when your body no longer recognizes when it is full. HFCS has been linked to Diabetes and Obesity. Inorganic phosphates, chemical additives designed to improve the texture of foods such as meats, cheeses, beverages and bakery goods, have been linked to lung cancer. These ingredients, found in most processed foods, hurt the environment as well. Yes, processed foods require a lot of natural resources to make them attractive and convenient ... but the problem we're talking about today is the danger to the environment when these artificial ingredients end up in our landfills and leach into the soil and waterways. What happens when animals ingest these chemical additives? Higher than normal levels of phosphates can make aquatic systems so productive that they choke themselves out. Hydrogenated & partially hydrogenated oils have been known to cause emphysema, respiratory distress, anemia, constipation, irritability, and blindness in animals. Mice who have ingested high fructose corn syrup have shown reproduction problems and heart disease. The fact is that artificial ingredients hurt everything ... our health, the environment and everything that lives. So ... today's tip is easy ... eat whole foods ... foods which are unprocessed and unrefined, or processed and refined as little as possible before being consumed. Eat fruits, vegetables and foods as close to their natural form as possible. Shop the perimeter of the supermarket rather than the center (most processed foods are located in the center of the store). We no longer have the luxury of making our food choices based simply on our health ... we now must consider the environment and all living creatures when we decide between processed foods and whole foods. 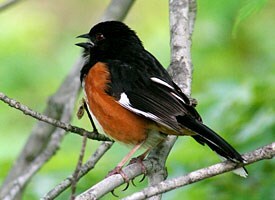 In the last few days, I've had some welcomed visitors ... a beautiful pair of Eastern Towhees have returned after wintering elsewhere. On our walks we see crocuses sprouting ... and Marmots are beginning to peek out of their burrows. Spring is traditionally a time to tackle those big cleaning jobs. Instead of using toxic chemicals, opt for more earth-friendly cleansers. Click HERE for ideas and recipes. Clean out closets and drawers and donate usable items to a charity, thrift stores or post them on FreeCycle. Check the batteries on smoke detectors and make sure they are working properly (okay, it's not a "green" tip but ... it's important). Take a look at air filters and wash or replace them as necessary. Plan a vegetable garden. When considering which veggie to grow, consider heirloom varieties which help to preserve biodiversity. Consider natural pest control rather than toxic pesticides (for a list, click HERE). And rather than commercial fertilizers, start a compost pile to nourish your garden. If you'll be landscaping your yard, opt for native plants which don’t need as much water and fertilizer. Dry your clothes outside rather than use the dryer. Sweep your patio, deck or walkway instead of using an air blower. Use a push mower instead of a power or gas mower. Switch the direction on your ceiling fan to cool (here's a hint ... when you stand under the fan you should feel the air blowing down on you). When the fireplace is no longer being used, close the damper. Spring is a time of renewal ... so renew your commitment to a "greener" lifestyle and enjoy the warmer days ahead. This winter has been cold for most of us ... and snowy for many. Are you wishing for spring? I can invite you to take a trip today ... to somewhere warm and exotic. Would you like to join me in Brazil? Let's go! 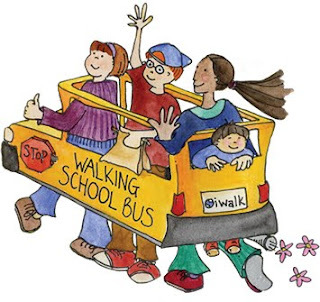 Climb aboard my magic bus ... it can travel great distances in a flash. In January we met Mr. Tom Rooney, CEO of SPG Solar. At the time, he was taking issue with some comments made by Bill O'Reilly and, in the process, shared his take on solar panels (you can read that article HERE). Mr. Rooney recently returned from a trip to China and shares his thoughts about their solar energy efforts ... and the efforts of one, progressive city in the U.S.
Something’s gotten into those Gators. First, they won back to back championships in college basketball. Then they added a national football title to the mix, along with a Heisman trophy. The Gainseville city leaders became the first in the country to set a competitive price for people who create renewable energy with their solar panels or wind farms or whatever, and who sell it back to the local utility. They call it a feed-in tariff, if you must know the technical term. But it is simply the price you receive for generating your own power then selling it back to the utility. Many solar leaders regard it as the key to the next step in the growth of solar in America -- both the use and manufacture. Which is also the key to creating energy independence and reducing carbon. Which of course we are not doing enough of. On a recent trip to China, I visited several large factories where they make solar panels. I wish everyone who wishes America to be an energy super power could have seen what I saw. These factories are world-class models of efficiency and skill. Their managers, many of whom are trained in the United States are very good and getting better. Many of the panels they make are going to places where local utilities pay premium prices for solar power generated on rooftops; there is no doubt that wherever solar owners receive higher prices, more solar power exists. In Germany and Spain and France and Italy, the feed-in tariff is as high as 72 cents per kilowatt hour. In Germany it is the highest, that is why they have more solar than anyone anywhere. And most of this they did ten years ago. In Gainseville, they recently set their price at 32 cents per kilowatt hour. Interest in solar in this college town is exploding far beyond what an economist might expect from the financial incentives alone. Which tells us that people have important economic and non-economic reasons for using renewable energy. If only they get the chance. A competitive feed in tariff is just the beginning. The bigger the local market for solar, the greater the chance for local manufacturers to compete. And that is what is missing in America so far. Missing from the plans of those who hope for tens of thousands of green jobs; Missing from the folks who crave energy independence. Missing from those who say solar is the cure for carbon. But not missing in Gainseville -- where their 32 cent per kilowatt hour is a message to the rest of the country that this is what people do who are serious about energy independence and carbon reduction. Compare that with California, the most solar friendly place in America, where solar power owners are lucky to get 1/3 of that. There’s always a reason why we are not going whole hog on solar. The grid is not ready. The price is too high. We have more and better energy in -- fill in the blank -- that all we have to do to get it is -- fill in the blank. But the blanks are always years and years and trillions of dollars away. Meanwhile, Asian suppliers and European competitors are racing ahead. Today our national leaders correctly say that America can and should be a world power in renewable energy. But business leaders in Asia feel America will not get there. If we are going to compete -- let alone win - for this world energy championship, we are going to have to act like winners. And we can begin by acting the way they do in the hometown of the national championship Gators. I'd like to thank Mr. Rooney for that interesting and informative article. Last week I told you about an Art Auction for charity which I am involved with. 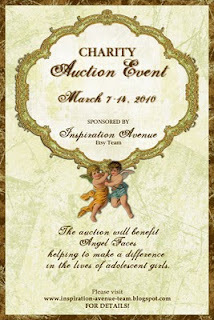 The bidding has officially begun and will continue through March 14th ... so I'd like to personally invite you to drop by and browse the lovely items. Look closely ... you'll see some of my very own earring creations and some original art by "Art Ist". 100% of the proceeds go to Angel Faces ... it's a worthy cause. So ... please stop by, purchase if you can, and spread the word to everyone you know! This month's recipe is one of my favorites. At first glance it might appear to be complicated but it actually comes together quite easily and quickly. It includes the exotic flavors of Vietnam and is ... well ... goodness in a bowl. I hope you enjoy it! Put stock, soy sauce, garlic, and onion in a large stockpot and bring to a boil over medium heat. Meanwhile, char ginger on all sides over an open gas flame or in a small skillet. Add to the stock. Add the cinnamon sticks, star anise, and bay leaves to the broth. Reduce the heat to low. Simmer, partially covered, for 20-25 minutes. Remove solids with a slotted spoon or strain the broth through a fine-mesh sieve. Adjust seasonings if necessary. Return to pot and keep hot until ready to use in soup. Make the broth as directed. When broth has been simmering for about 10 minutes, prepare rice noodles as directed on package. Drain the noodles and divide them among six bowls. Simmer the seitan in the broth until heated through, about 4 minutes. Remove the seitan with a slotted spoon and slice thinly into six portions. Add to noodles. Assemble the soup by placing the bean sprouts, cabbage, greens, basil, cilantro, scallions, and optional peanuts on top of the noodles and seitan. Ladle the hot broth onto the noodle mixture. Serve with a plate of lime wedges, sliced peppers, and salt and pepper for individual seasoning. We often substitute dried shitake mushrooms for the seitan, adding them to the broth for the entire cooking time. Try cubed, firm tofu for added protein and variety. Experiment with vegetables you might have on hand ... cut them thinly, similar to a stir-fry preparation. If you have a vegan recipe which you'd like to share with Reduce Footprints' readers, please send it to the email address listed in the side bar. We publish a vegan recipe on the first Friday of each month.